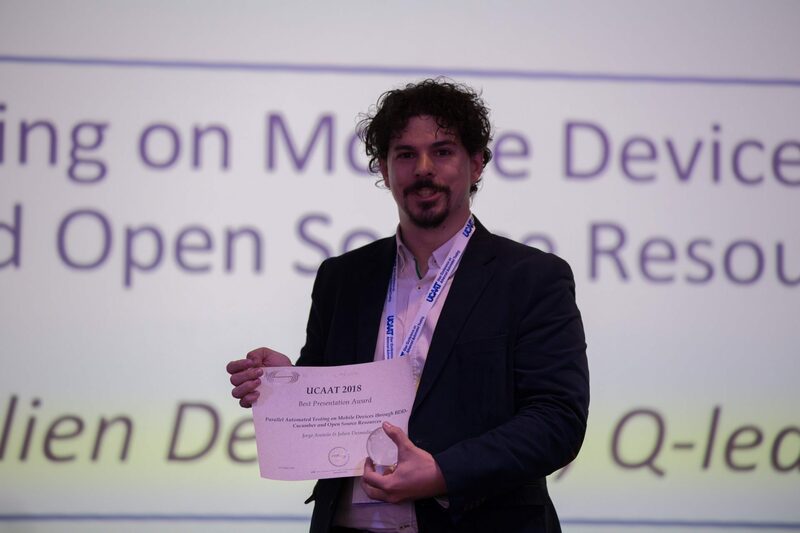 Jorge Asensio, our Test Automation Specialist at q-leap, received the “Best Presentation Award 2018 ” in UCAAT 2018 Conference for his presentation “Parallel Automated Testing on Mobile Devices through BDD Cucumber and Open Source Ressources”. The presentation focused on the experiences and results achieved during the development of multi-device-driven testing framework. UCAAT is ETSI’s annual conference on test automation focusing on both test design and test execution automation. The conference aim is to create a dialogue between users and develop a community to exchange best practices. Recently, many advances have been made in test automation. At q-leap, we’re proud of our colleague Jorge A. awarded for his presentation! Jorge Asensio is an ISTQB-certified tester and Scrum Developer. In the last two years he has been developing test-automated frameworks to build mobile laboratories at q-leap. Previous experiences include collaborations in test planning and automation for ERP software, IPTV-Video, Online Marketing, Online Security and large-scale corporate-management applications. “UCAAT offers an opportunity to come together to share and learn from real life testing experiences!” says J. Asensio. For more information on the presentation, feel free to contact us!